Now is the accepted time to make your regular annual good resolutions. Next week you can begin paving hell with them as usual. Yesterday, everybody smoked his last cigar, took his last drink, and swore his last oath. To-day, we are a pious and exemplary community. Thirty days from now, we shall have cast our reformation to the winds and gone to cutting our ancient short comings considerably shorter than ever. We shall also reflect pleasantly upon how we did the same old thing last year about this time. However, go in, community. New Year’s is a harmless annual institution, of no particular use to anybody save as a scapegoat for promiscuous drunks, and friendly calls, and humbug resolutions, and we wish you to enjoy it with a looseness suited to the greatness of the occasion. 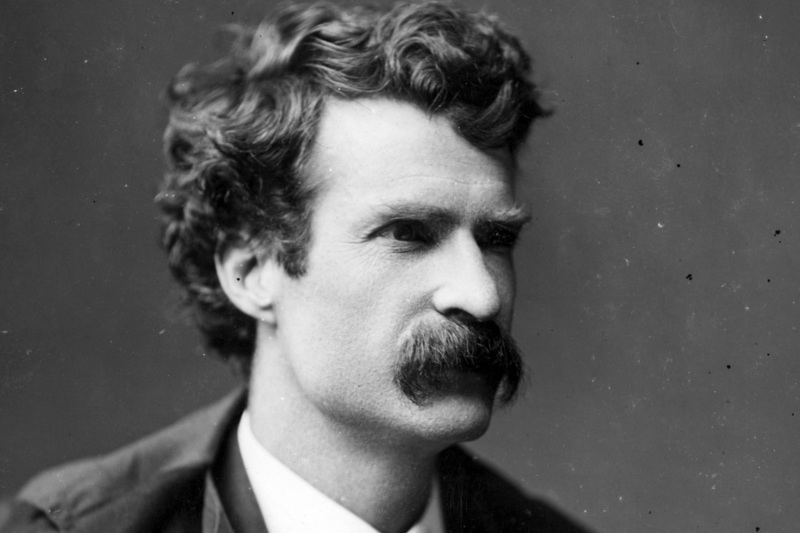 Twain made a career of skewering the countless pieties of American life, and the culture’s perhaps overzealous spirit of self-improvement provided him a vast and never fully deflatable target. His assessment feels as true today, and makes us laugh just as much today, as it must have 153 years ago. So keep enjoying the friendliness, festivity, and human comedy of the New Year’s holiday as Twain would have. May 31, 1889, Walt Whitman’s seventieth birthday, occasioned a celebration of the poet in his hometown of Camden, New Jersey, with a several course dinner called “The Feast of Reason” followed by a program called “The Flow of Soul,” a succession of testimonial speeches and readings by prominent politicians and a few minor literary figures. Whitman himself was in ill health, but he managed to attend during dessert, deliver a brief response, then stay for over two hours afterward (see the event’s original program, with menu, here). While the event itself, writes Ed Folsom in the Walt Whitman Quarterly Review, was intended as a “local celebration of Camden’s most famous personality,” the occasion prompted admirers worldwide to send birthday wishes by wire and letter. Some of the famous literary figures who wrote included John Addington Symonds, William Dean Howells, John Greenleaf Whittier, and Mark Twain. You have lived just the seventy years which are greatest in the world’s history & richest in benefit & advancement to its peoples. These seventy years have done much more to widen the interval between man & the other animals than was accomplished by any five centuries which preceded them. What great births you have witnessed! The steam press, the steamship, the steel ship, the railroad, the perfected cotton-gin, the telegraph, the phonograph, the photograph, photo-gravure, the electrotype, the gaslight, the electric light, the sewing machine, & the amazing, infinitely varied & innumerable products of coal tar, those latest & strangest marvels of a marvelous age. And you have seen even greater births than these; for you have seen the application of anesthesia to surgery-practice, whereby the ancient dominion of pain, which began with the first created life, came to an end in this earth forever; you have seen the slave set free, you have seen the monarchy banished from France, & reduced in England to a machine which makes an imposing show of diligence & attention to business, but isn’t connected with the works. Yes, you have indeed seen much — but tarry yet a while, for the greatest is yet to come. Wait thirty years, & then look out over the earth! You shall see marvels upon marvels added to these whose nativity you have witnessed; & conspicuous above them you shall see their formidable Result — Man at almost his full stature at last! — & still growing, visibly growing while you look. In that day, who that hath a throne, or a gilded privilege not attainable by his neighbor, let him procure his slippers & get ready to dance, for there is going to be music. Abide, & see these things! Thirty of us who honor & love you, offer the opportunity. We have among us 600 years, good & sound, left in the bank of life. Take 30 of them — the richest birth-day gift ever offered to poet in this world — & sit down & wait. Wait till you see that great figure appear, & catch the far glint of the sun upon his banner; then you may depart satisfied, as knowing you have seen him for whom the earth was made, & that he will proclaim that human wheat is worth more than human tares, & proceed to organize human values on that basis. 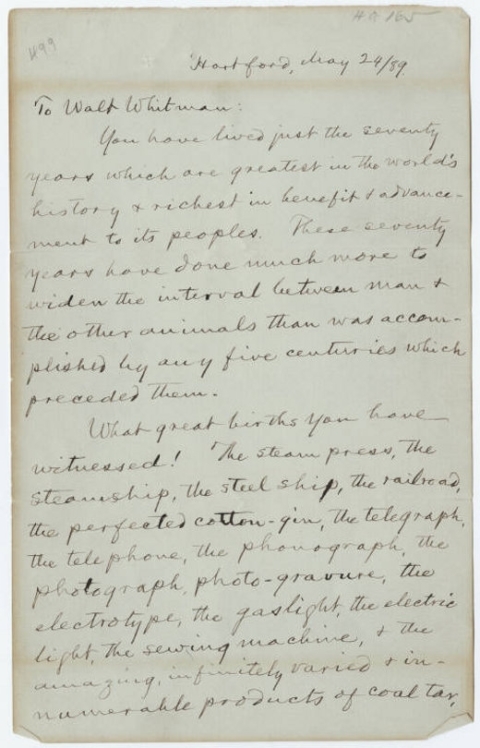 See Letters of Note for the remaining images of Twain’s letter. You can peruse all of the speeches, letters, and telegrams addressed to Whitman on his 70th birthday in the collection Camden’s Compliment to Walt Whitman, published that same year. For many more fascinating historical letters, be sure to check out Letters of Note’s new book, Letters of Note: Correspondence Deserving of a Wider Audience. You ought never to take your little brother’s “chewing-gum” away from him by main force; it is better to rope him in with the promise of the first two dollars and a half you find floating down the river on a grindstone. In the artless simplicity natural to this time of life, he will regard it as a perfectly fair transaction. In all ages of the world this eminently plausible fiction has lured the obtuse infant to financial ruin and disaster. If at any time you find it necessary to correct your brother, do not correct him with mud—never, on any account, throw mud at him, because it will spoil his clothes. It is better to scald him a little, for then you obtain desirable results. You secure his immediate attention to the lessons you are inculcating, and at the same time your hot water will have a tendency to move impurities from his person, and possibly the skin, in spots. If your mother tells you to do a thing, it is wrong to reply that you won’t. It is better and more becoming to intimate that you will do as she bids you, and then afterward act quietly in the matter according to the dictates of your best judgment. Good little girls always show marked deference for the aged. You ought never to “sass” old people unless they “sass” you first. 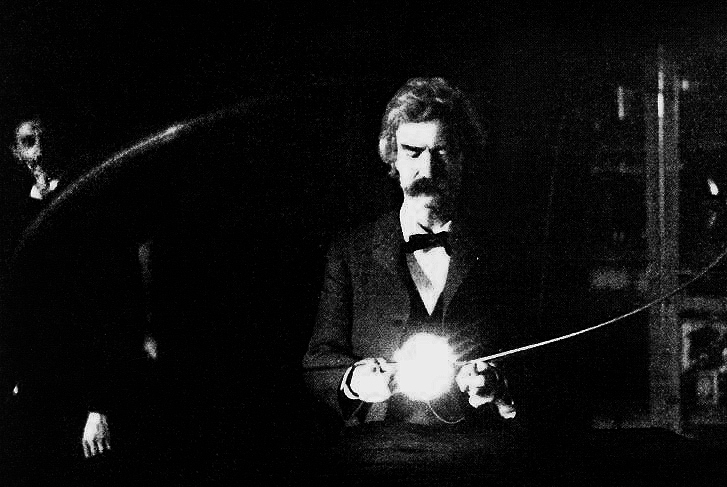 Then again, Twain also knew, as any master humorist does, that nothing funny ever benefited from too much explanation. We’ll thus leave you with a link to Project Gutenberg’s collection of 216 free e-books of his work, among which a bit of time spent should turn any one of us into enthusiasts of all things Twain. My Penguin Classics copy of Mark Twain’s Life on the Mississippi sits alone atop an overfull shelf. There is a bookmark on page 204, exactly halfway through, torn from an in-flight duty-free catalog—whiskey and fancy pens. It tells me “hey, you forgot to finish this, you [various obscenities].” And I shrug. What can I say? I went to grad school, where I learned to read ten books at once and never finish one. Good thing Mark Twain didn’t write that way, or we might not have Life on the Mississippi. Twain was a diligent and conscientious writer with a memory like a bear trap, or at least that’s what he wanted us to think. But somewhere in his reminiscence he may have been confused. 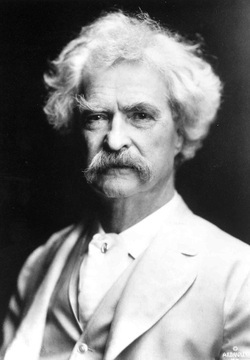 Twain wrote in his 1904 autobiography that his first novel written on a typewriter—the first typewritten novel at all—was Tom Sawyer. Was this so? 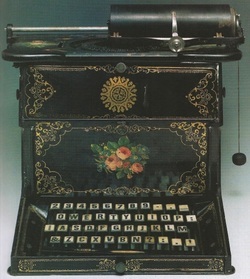 Twain purchased his first typewriter (which probably looked like the Remington Sholes and Glidden above) in 1874 for $125. In 1875, he writes in a letter to the Remington company that he is no longer using his typewriter; it corrupts his morals because it makes him want to swear. He gives the infernal machine away, twice. It returns to him each time. The year after Twain’s moral trouble with his Remington, Tom Sawyer is published from handwritten manuscript, not typed. Then, seven years later, Life on the Mississippi comes to the publisher in typescript. Twain did not type it himself—he had presumably renounced the act—but he dictated the memoir to a typist from a hand-written draft. Now, I can hear you quibbling… Life on the Mississippi isn’t a novel at all! Well, okay, fair enough. Let’s just say it’s the first typewritten book and call it a day, eh? Go read this excellent New Yorker piece on the early life of the typewriter and leave me alone. I’ve got a book to finish.